Contact Grill & Sandwich Maker Ideal for cooking a wide range of foods quickly Healthy cooking with less oil Stainless steel housing Oil collector tray 180 degree opening Adjustable height Thermostat knob for easy control of heat Adjustable hinges helps accommodate food of different size Easy to clean, simply wipe off the non-stick grill plate & empty the drain cup 2000 W.
Glen 2000W Black Sandwich Grill, GL 3037 is a premium quality OTG / Oven Toaster Griller from Glen. Moglix is a well-known ecommerce platform for qualitative range of OTG / Oven Toaster Griller. All Glen 2000W Black Sandwich Grill, GL 3037 are manufactured by using quality assured material and advanced techniques, which make them up to the standard in this highly challenging field. 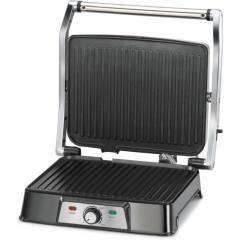 The materials utilized to manufacture Glen 2000W Black Sandwich Grill, GL 3037, are sourced from the most reliable and official OTG / Oven Toaster Griller vendors, chosen after performing detailed market surveys. Thus, Glen products are widely acknowledged in the market for their high quality. We are dedicatedly involved in providing an excellent quality array of Glen OTG / Oven Toaster Griller.